Thelma Irene (Davenport) Girty, 90, of Warner, passed away from this life on Sunday, February 10, 2019. She was born on July 11, 1928 in Centralia, OK to Orville and Leda Davenport. She loved and cherished her 23 grandchildren along with numerous great-grandchildren, of which she lost count of how many. Thelma worked as a cook all her life in several cafés, colleges, and retired from Winfield State Hospital. 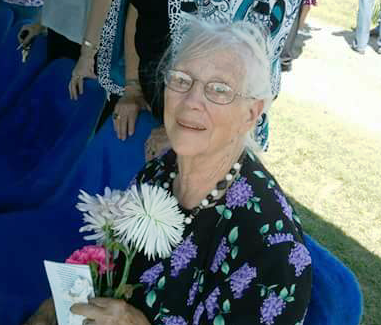 She enjoyed cooking for everyone, going to yard sales, sewing and quilting, planting flowers, visiting with family and friends, writing letters and sending cards, collecting and dressing her dolls, showing everyone her dolls and quilts, and setting on her porch swing in the sunlight. She will always be remembered as a loving mom, granny, sister, aunt, and friend. She will be missed by all. Thelma was preceded in death by her parents; siblings, Danny Davenport, Jane Livingston, Orvilla Moody; her children; Donna Hopps, Jimmie Claggett, Shirley Boggs, and Geneva Girty. Survivors include her brothers, Jack Davenport and wife Faye, and Duane Davenport; sons, Lester Claggett, Larry Claggett, Billy Claggett, and Albert (Boy) Girty; daughters, Georgia Justice and Doree Girty; along with many other family members and friends. Funeral services celebrating Thelma’s life will be 10AM, Thursday February 14, 2019 at Cornerstone Funeral Home Chapel in Muskogee. Graveside services and interment will be at 2:00 PM at Bluejacket Cemetery in Bluejacket, Oklahoma.